The title, “The Body Electric” comes from a book, “The Body Electric: Electromagnetism and the Foundation of Life” by Robert O. Becker and Gary Selden in which Becker, an orthopaedic surgeon, describes his research into “our bioelectric selves”. Becker set out to examine why normal bones heal, and then explore the reasons why bones fail to heal properly. His experiments were mostly with salamanders and frogs, and his scope was widened to studying regeneration after lesions such as limb amputation. He suspected that electric fields played an important role for controlling the regeneration process, and therefore mapped the electric potentials at various body parts during the regeneration. This mapping showed that the central parts of the body normally was positive, and the limbs negative. When a limb of a salamander or frog was amputated, the voltage at the cut was lessened —a phenomenon called the current of injury. In a frog, the voltage would simply change to the normal negative after some weeks, and no limb regeneration would take place. In a salamander, however, the voltage would eventually normalize —and the limb would be regenerated. The electric field changes turned out to be caused by currents in the nerves, and the limb regeneration occurred from red blood cells. Becker later observed several interesting properties of bones and bone growth, proposing that bones are semiconductors and piezoelectric in nature. These tie into the healing process by electrically stimulating bone marrow cells to differentiate into a form of adult stem cells which regrew the bone from within by regeneration. By applying external electrical stimulation in the proper form, he was able to induce bone healing in patients whose bones had failed to heal together. Later in his research, observing from prior research that silver had been used as an antibacterial material in the past, he used a combination therapy of silver with electrical stimulation to drive silver ions further into tissue to enhance its antibacterial action. With proper stimulation fibroblasts would dedifferentiate and apparently became able to form new cell types, leading to the possibility of wider uses for regenerative healing in humans and other animals. There was a hose going asymmetrically across the shoulder on an old concept art piece, I wanted have that asymmetry to break up the bilateralism. The bandy balls on the joints are from The Moonbase. 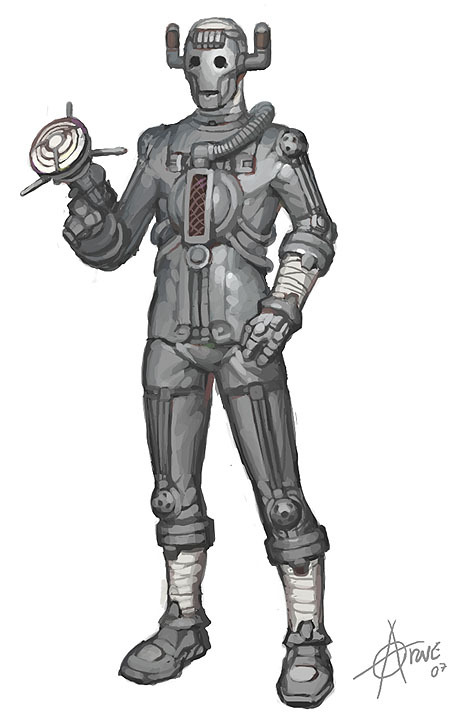 The joint tubes and tight diving suit are from The Wheel in Space. The chest/shoulder (lower pecs) have a hard edge to them, giving the impression that there’s not a soft body under the suit there. The bandages are from The Tenth Planet, but I moved them to the wrists to break up the suit into parts, which serves to enhance the cyborg look. It also makes them look a bit like walking dead with a violent medical history. 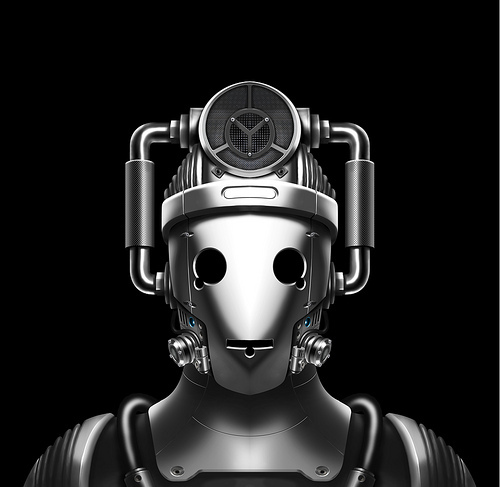 The face is from the new 2006 series Cybermen. If the steel mask is removed a bandage face from The Tenth Planet can be seen. The horns are an experiment. 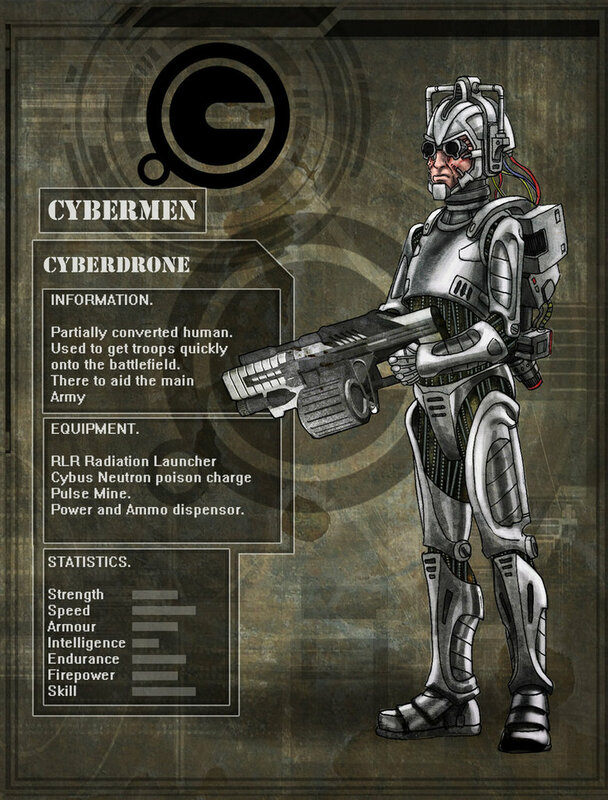 The gun is devenloped from The Tenth Planet belly flash weapon. The rust material on the horns are from a spaceship seen in The Revenge of the Cybermen. I also use this material on my Cybermen spaceship designs. I like Gun Metal / Brushed Metal. I don’t like shiny silver. The Cybermen ships are partly inspired by the ships seen in Wheel of time, The Invasion, and Revenge of the Cybermen. The Invader (longest ship) has a central honeycomb structure containing invasion ships. The main cannon is some kind of large accelerator, and there are also a bunch of ‘smaller’ turrets. The transport is modular and can stretch on, repeating the cargo segments. I’ve called this image “We Shall Cast Off The Weakness Of The Flesh”. This is just something I was playing with. It is based on a 16th Century anatomical study by Juan Valverde de Amusco called “Anatomia del corpo humano” which shows a cadaver apparently having removed its own skin with a knife to reveal the muscle structure beneath. I’ve (obviously) somewhat heavily added to this, giving the figure a “10th Planet” style Cyberman head (the original design from their first ever appearance on TV) and then rather gone to town on adding cybernetic life support systems to the body, and generally mucking about with things, playing on the idea of Mondas (the Cybermen’s home planet) being a dying world set adrift from a regular orbit to wander on its path and the Mondasians choosing to abandon their humanity in search of cybernetic immortality – as the Cybermen say, “We Will Survive”. 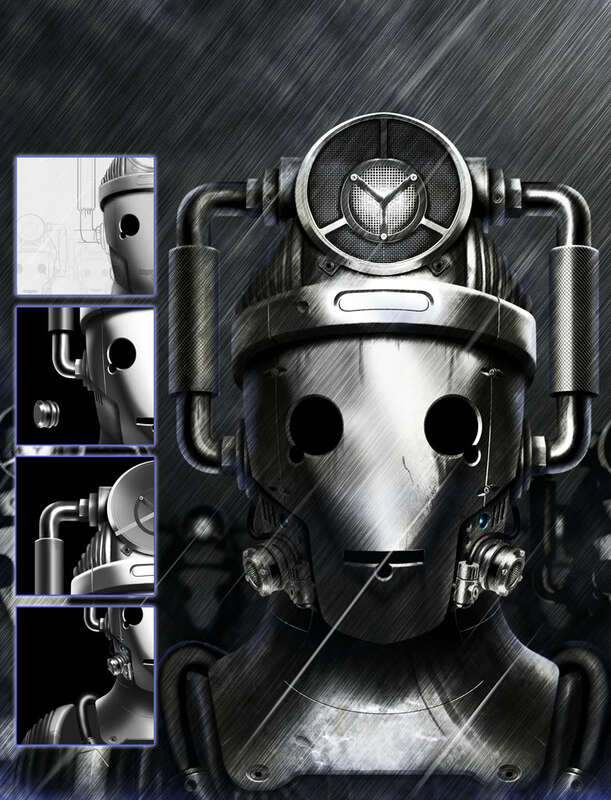 In the Cybermen’s case, the shedding of their skins is both symbolic and literal, as along with their failing organic body parts they also chose to discard their other “limitations” – emotions – in favour of pure logic, and thus in the process of making themselves free from the “weaknesses of the flesh” – love, desire, hatred, ambition, joy (and so on) they become something less than human; true “monsters” – because they are in essence humanity without any saving graces, with no purpose other than survival for the sake of survival. Life in essence is only worth living because of the very limitations of the flesh; to discard ones humanity is to become a true Cyberman. Doctor Who – The Animated Series was a proposed cartoon version of Doctor Who. In the early 1990s, whilst the BBC were in negotiation with David Segal and CBS, they were also in talks with Canadian animation house Nelvana (who made such shows as “Droids” and “‘The Raccoons”) with regard to producing an animated version of Doctor Who. Concept sketches were prepared by artist Ted Bastien and scriptwriting had begun when the project was cancelled. 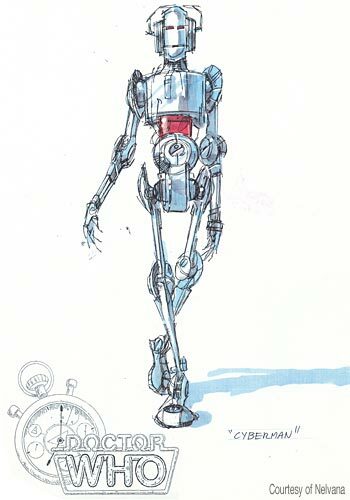 This is Ted Bastien’s concept sketch for a “Dr Who – The Animated Series” Cyberman.